The Network Rail plan was for engineering works in the Southampton Airport area through the weekend, with freight and cross-country traffic diverted mainly via the Laverstock Loop, and SWR and some freight by the Portsmouth Direct. 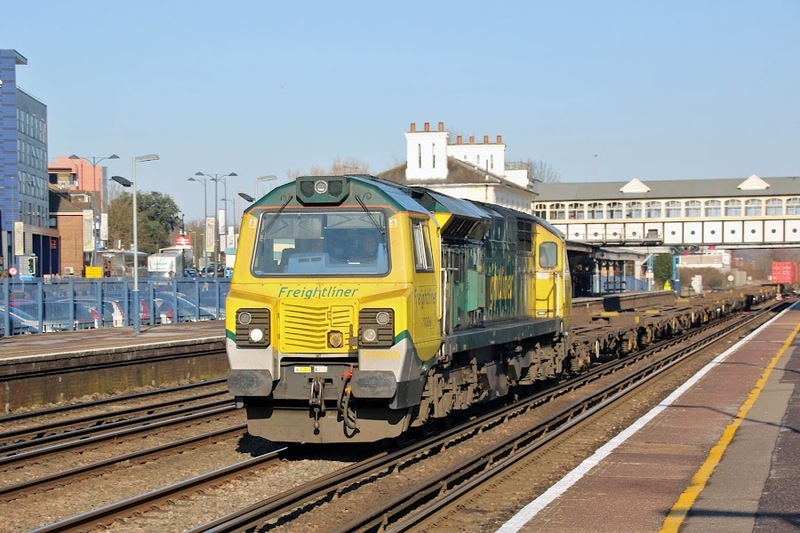 However snow fell as anticipated on Thursday, and unpredicted on Friday, the latter disrupting both the South Western Main Line and the M3 in the Basingstoke area. The Saturday engineering works were cancelled, and after a few earlier runs by the Laverstock Loop, the Freightliner and cross-country traffic reverted to the SWML, with fast running through lack of conflicting trains. This included at Eastleigh, where there were no crew change stops, leading to fast passes through the station. A plan for 'divert' photos at Romsey had to be changed to Eastleigh at short notice - 4O05 rolled past while I was walking from my car. 70006 4O27 05:21 Garston - Maritime. All of the pictured workings were substantially 'Fresh Air Express' probably reflecting the time of year. Earlier at Worting Junction. 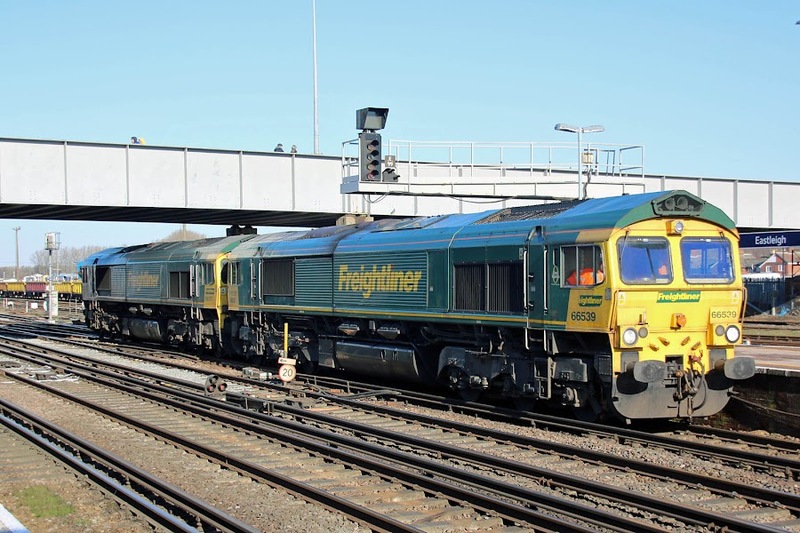 70008 4O90 05:27 Leeds - Maritime, with many KTA pocket wagons. 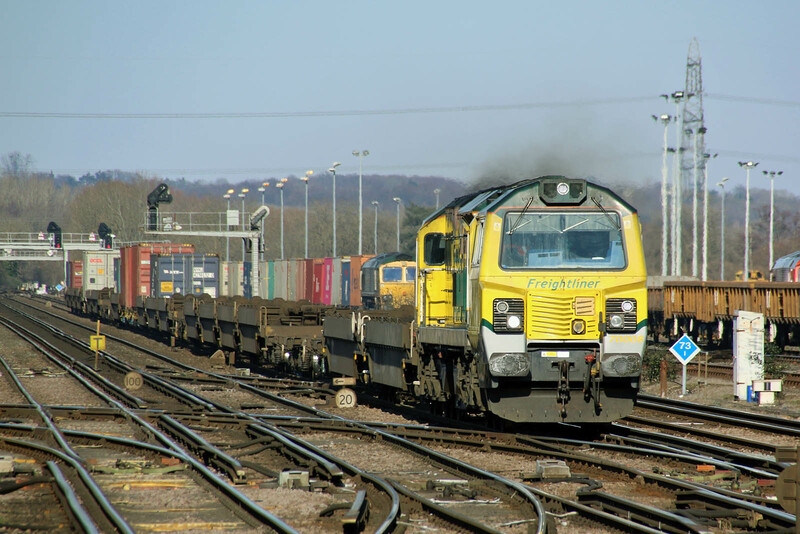 66542 lies in the background with 4O22 01:23 Trafford Park - Eastleigh Yard (for later forward working after the engineering works). Earlier at Worting Junction. 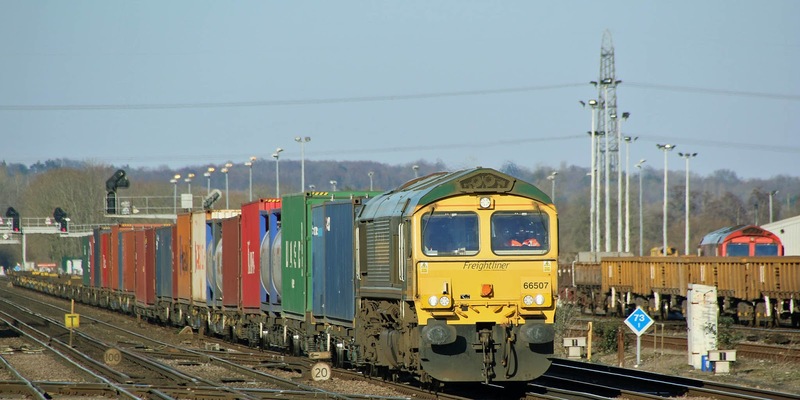 66507 4O29 08:50 Basford Hall - Maritime. Two further angles: one two, and earlier at Battledown. 66539 + 66517 work 0W26 from the East Yard - Maritime. 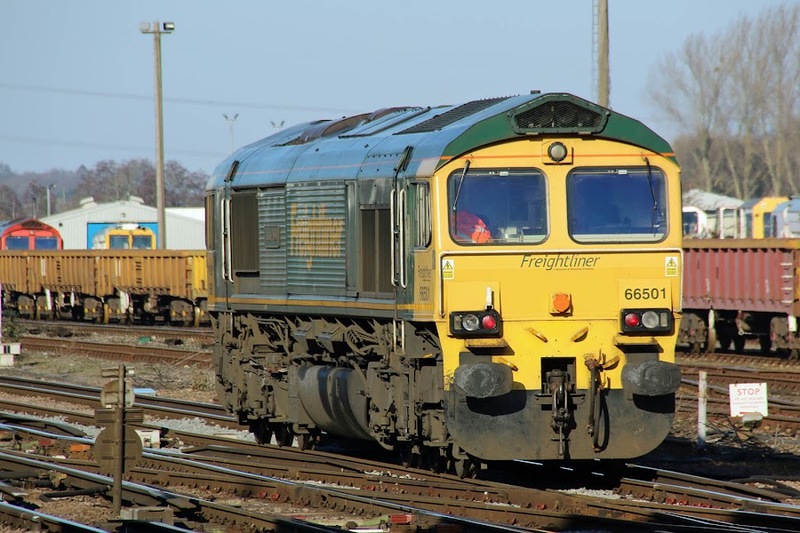 66517 had worked south from Hinksey with 6O26. 66501 Japan 2001 arrived from Maritime as 0W29, usually this working is to take up weekend engineering duties from the yard. This locomotive is almost 20 years old, built in May 1999 and unloaded in July that year.